Recently I shook hands with a man who had been imprisoned for his faith for several years in a country hostile to Jesus Christ. We smiled and conversed, praising God for his release and all that God did in and through his time in prison. Suddenly, I can’t believe it. I can’t believe that I’m standing face-to-face with a Brother who surrendered all to our Jesus and lived through a hellish experience – and he’s overflowing with joy as he talks! He looks familiar, too, but I can't make sense of why that would be. I know I've never met him. Then this Brother said that if I ever make it to his country, I’m invited to his church. His underground church. I try to take it all in. I’ve just been invited to an underground church. Definitely first time to receive that kind of invitation! I have a Bible in my own language. In fact, I have several. I also have one on my mobile devices, accessible any time I want it. I have a church, complete with a sound system, air conditioning, a preacher who freely shares the Word and the freedom to sing as loud as we want, when we want, how we want. Did I mention it’s only a short drive away? Yet, for example, in many countries believers must whisper or even mouth their worship songs for fear of being heard. My family doesn’t live in daily fear of being arrested or kidnapped or martyred for our faith. We go about our daily lives with relative ease and freedom and peace in this respect. Then I look at this Brother and realize he went through some of those things like whispering worship songs, not having adequate Bibles in his own language, and being arrested and thrown in prison for his faith. But instead of being discouraged or bitter about what happened, this Brother is standing in front of me beaming, praising God and sharing the story of what God did every chance he gets! It’s time for the Body of Christ to wake up, to rise up and join the Good Battle. To join ranks with believers around the globe and support our Brothers and Sisters in Christ who face persecution all the time and to aid them as they continue to share the Good News even in the midst of it all. Perhaps one way you can join the Good Battle is by encouraging your Brothers and Sisters in Christ who are imprisoned for their faith in Jesus. You can write them an encouraging letter through The Voice of the Martyrs’ site, Prisoner Alert. VOM has phrase selections and Scriptures to choose from that they have translated into the prisoner’s language. It takes only two minutes and can have such an amazing impact on a Brother or Sister who is suffering for Christ. Oh and as for why that particular Brother looked familiar? I realized that years ago, he was one of the prisoners I had written to and prayed for! How amazing it is that God orchestrated our meeting years later. Not only that but that I was also able to hear how God worked in his life and used the prayers of believers around the world as he was in prison. Pretty awesome if you ask me! So what are you waiting for? 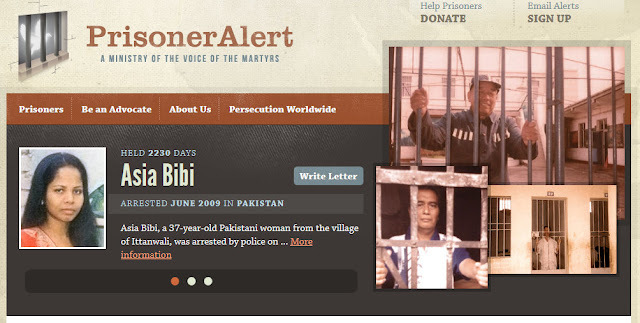 Head on over to Prisoner Alert and prayerfully pick a prisoner or two or ten to write to and pray for. God can use your letter in a beautiful and powerful way to lift up another believer around the globe. What a privilege!